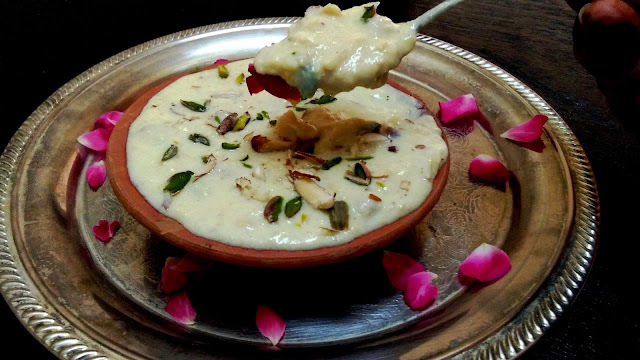 Makhana is generally used for religious activities and is consumed during fast. Some consume fried makhana with sendha namak and some cook the makana into a dish and consume with kuttu ki poori. Makhna is made from louts seeds. Makhana just like badam and walnut is rich with potassium, phosphorus and magnisum and thus is really good for health and is a wealthy source of energy. My family and I love to eat makhana. I usually prepare the makhana gravy or fried masala makhane or makhana kebab for my family. During fast we i prepare the gravy makhana without onions or garlic and it brings out the real taste of makhana. However i recently, on the website of Neha Mathur saw the recipe of makhane ki phirni and just loved it. While preparing this recipe inspired by Neha Mathur, I decided to give it a little twist of my own. Thus, I added poppy seeds paste which make it more delicious and creamy. I give full credit of Neha of inspiring me to make this recipe and would like to thank her for giving us such a wonderful recipe. सबसे पहले खस खस को १ घंटे के लिए हलके गरम पानी में भिगो दें और फिर उसकी महीन पेस्ट बना लें. Soak the poppy seeds for 1 hour in Luke warm water and make a fine paste. Heat 2 tbsp ghee in a pan then fry the makhana until crisp on slow heat, add remainig 1/2 tbsp ghee fry the cashew nut and chop them. Cool completely and crush the makhana to a course powder. Lower the heat cook it till the mixture becomes thickened, add saffron and chopped nuts. Remove from the heat and transfer the phirni in serving bowl.